At the American Bread Company, we believe in giving back to local communities. We show our appreciation for customers not only within our bakery-cafes but also throughout the communities we serve by participating in charitable events and partaking in various Operation Dough-Nation® programs. 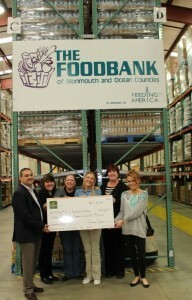 American Bread team members participate in the Food Bank of South Jersey Annual Hunger Games and present a check in the amount of $14,200, from their Operation Doughnation program. 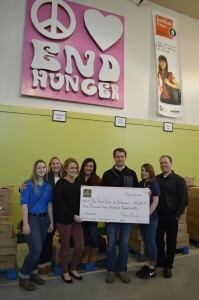 American Bread Team Members volunteer at the Food Bank of Delaware and present a check for $4,491 from our annual customer giving campaign – Operation Doughnation. 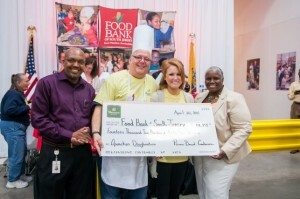 The donation enabled the food bank to provide over 9,000 meals to Delawareans! With the generous help of our customers, we have been collecting funds in all of our Panera Bread locations through our Share the Bread community breadboxes located at each register in our cafes. All charitable contributions are given to our charitable partners! Another component of the Operation Dough-Nation® program is our commitment to giving back to those who are hungry in our community. At the end of each day, all unsold bread and bakery products are donated to local food banks, pantries, and an array of non-profit organizations that are in need. American Bread Company together with Panera Bread, values corporate citizenship and often makes in-kind donations to community events and non-profit fundraisers. To have your event considered for an in-kind donation or auction item please visit www.panerabread.com/donations.